I’ve had these on my nails for three days and I’m only now photographing and posting them. Ah, I’ve gotten so lazy. That’s a lie. Yesterday I rearranged a bunch of things in my workroom because that’s what my heart wanted to do most. I’m really liking the changes. I’m going to try and polish off some of the bulkier projects I’ve got lying around in 2018 and just sheer get rid of some other things. It’s so hard trying to pry shinnies out of my cold, dead hands though. Speaking of cold, this is where the polar bear came in. 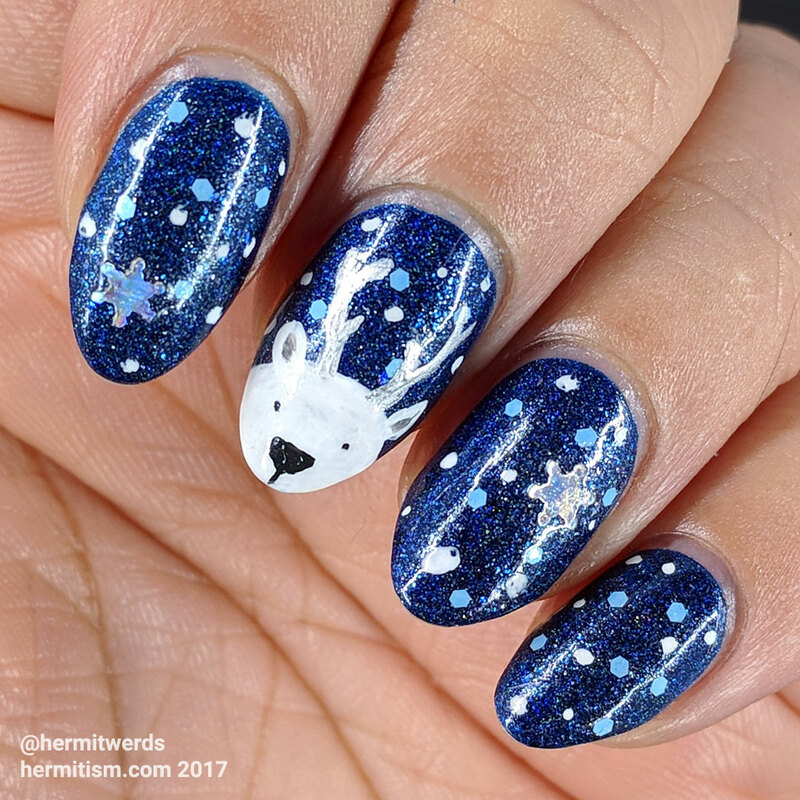 I figured if I were doing blue winter nails I should throw in some freehand. Polar bears freehand really easily. At least their heads do. So then I decided to be quirky and throw some silver reindeer antlers on top. You can’t accuse me of Christmas because it’s a polar bear and there’s no red and green! I’m not trying to hate on Sinful Colors though. 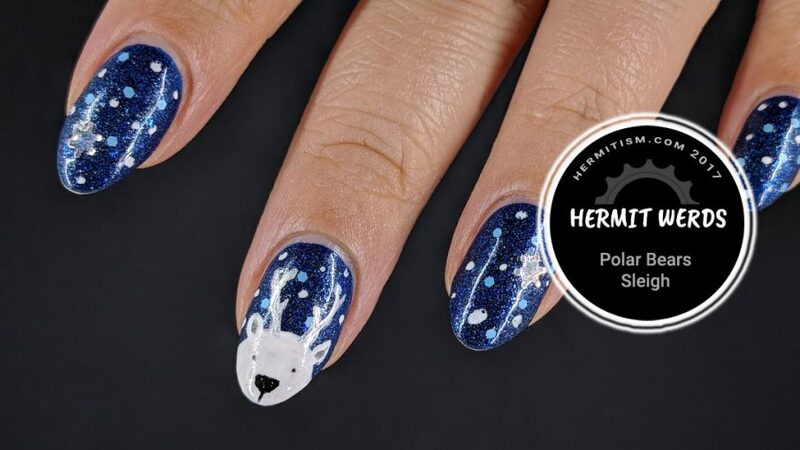 They are still my most numerous polish brand and I recommend their polishes highly as long as you check the review for how good they are. Considering I’d say the same about Essie, Zoya, OPI and every other brand out there, that’s still not a diss. 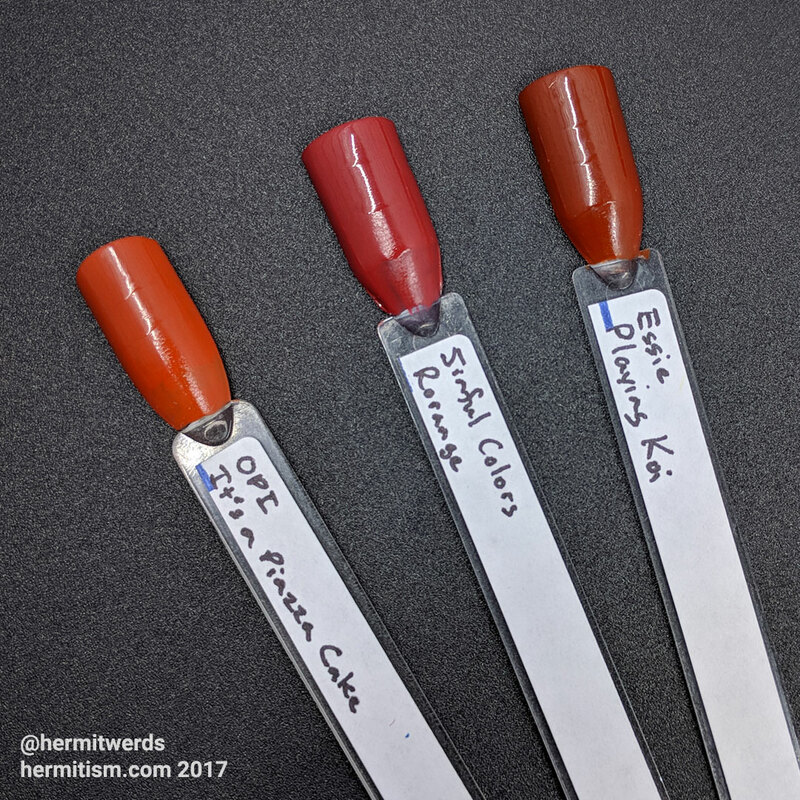 I was thrilled when I ran across their new collection for 2018 because they hard a dark desaturated orange-ish color called “Rorange” and I am loving desaturated oranges right now. It sits quite nicely between OPI’s “It’s a Piazza Cake” and Essie’s “Playing Koi” but with a little bit more of a rose-y blush to it. It made up for never receiving two of Born Pretty’s pumpkin collection polishes. I spent two months just hoping it would be the day and when I finally gave up the ebay seller kept trying to put off refunding me. When someone waits ten days after you asked them to wait another week and then instead of immediately refunding like you said you would you try to get them to wait more…first world problems. And I’m putting said seller on my never buy from again list, which unfortunately doesn’t seem to have a formal system on ebay. And oh, yeah, there’s an inLinkz where you can see the nail art of all the timely people who don’t want to rearrange their junk more than they want to sit down and take photos and such. Heh?